Calling upon the potent energy of Heruka Chakrasamvara, this fire puja pacifies obstacles, grants health, fulfills wishes and accumulates great merits for spiritual realizations and attainments. 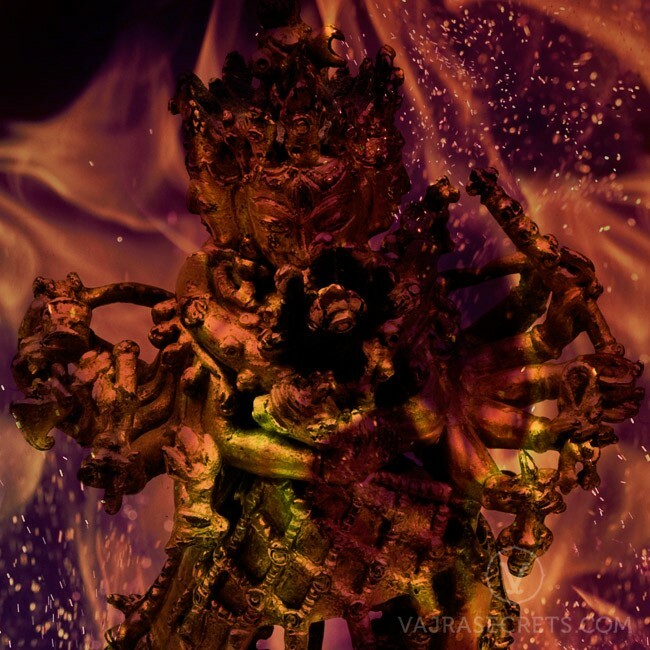 Heruka's fire puja is also one of the most effective practices available today for the transformation of one's mind and purification of past negative actions. An emanation of Buddha Shakyamuni and consort of Vajrayogini, Heruka Chakrasamvara’s practice is one of the highest tantras in Buddhism and is unique because it is the only Tantra (along with Vajrayogini's) whose effectiveness increases as the times degenerate further. His practice has led many women and men to full awakening within a single lifetime. With a majestic light-body of dazzling dark blue radiance, Heruka Chakrasamvara embodies the great bliss of inner transformation, the liberation from ignorance. He has four faces and twelve arms, representing the attainment of Enlightenment through the abandonment of the twelve dependent-related links of samsara and gaining the realizations of the four doors of liberation. Commonly depicted in union with his consort Vajrayogini, he ultimately represents the union of wisdom and compassion, or Emptiness and Bliss, which leads directly to the Enlightened mind. Heruka's fire puja is a very elaborate ritual during which many traditional substances are thrown into a fire and burnt, representing the removal and pacification of obstacles and problems that one is facing. This puja grants health, fulfills wishes and accumulates great merits for spiritual realizations and attainments. Heruka's fire puja also calms our immediate environment, grants protection and aids in the transformation of one's mind and purification of past negative actions.